BATON ROUGE, LA — During the federal government's partial shutdown, the Louisiana Department of Children and Family Services (DCFS) continues to work with the U.S. Department of Agriculture's Food and Nutrition Service (USDA FNS) to ensure Louisiana's Supplemental Nutrition Assistance Program (SNAP) recipients have access to their federal SNAP benefits. New applicants and current clients who are in the process of renewing their benefits are encouraged to not miss application or redetermination interviews and to turn in all requested documents as soon as possible. For more information, visit the DCFS website at www.dcfs.la.gov. How do I know when my February SNAP benefits have been issued? If you have your EBT card, you can call the number on the back of the card, 888-997-1117. 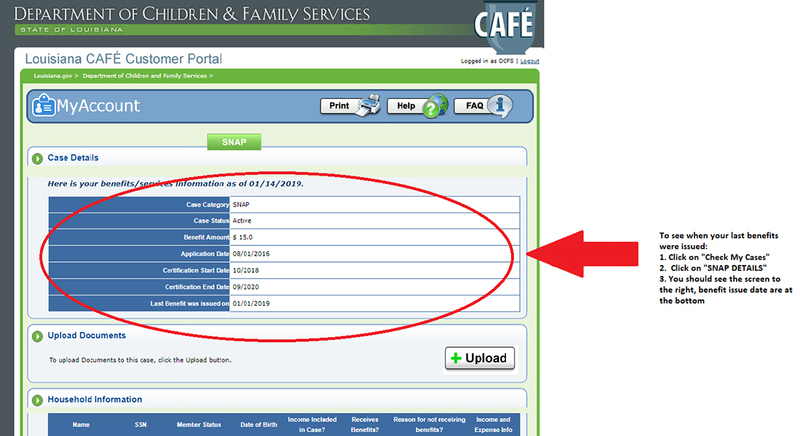 If you have access to a computer, you can log into your CAFÉ account, then click on Check My Cases. Select SNAP DETAILS, and you should see the screen show below, which will include the most recent benefit issue date at the bottom. You can call 888-524-3578 and select your language, then press options 3, 1, 5, 1. You can email LAHelpU.DCFS@la.gov for assistance. Why are February SNAP benefits being issued early? During the partial federal government shutdown, USDA has not yet been funded. However, a Continuing Resolution that expired Dec. 21, 2018, allows for the USDA to draw down funds for operation expenses incurred on or before Jan. 20, 2019. Therefore, SNAP recipients and applicants who have been determined eligible for February benefits before Jan. 20 will receive their benefits through that funding source on or before that date. 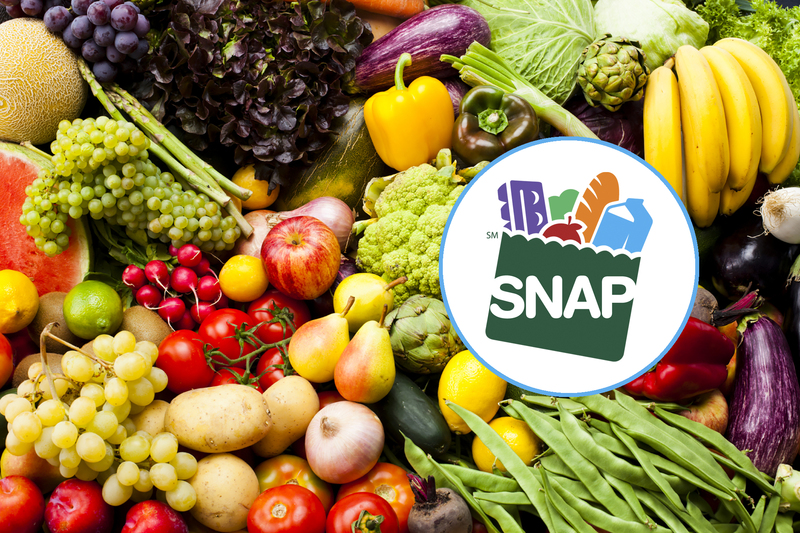 What about March SNAP benefits? If the partial federal government shutdown continues through February, it is unclear whether or to what extent SNAP benefits will be issued for March. All applicants and recipients should continue to pay attention to the news. DCFS also will continue to provide updates. For questions regarding how to complete individual pages within the online application, click the Help link on the top of the page to view page-level help. For help with computer usage, refer to the Help with Using a Computer resource on the first page of the online application by clicking the "If you haven’t used a computer very much and would like to practice before you get started, click here" link. If you are having problems with your LA CAFE application, please contact DCFS at 888-524-3578 between the hours of 7:30 am and 6:00 pm Monday through Friday. If you are unable to fill out the application on your own, staff at a local DCFS office are available to assist you with completing an online application. 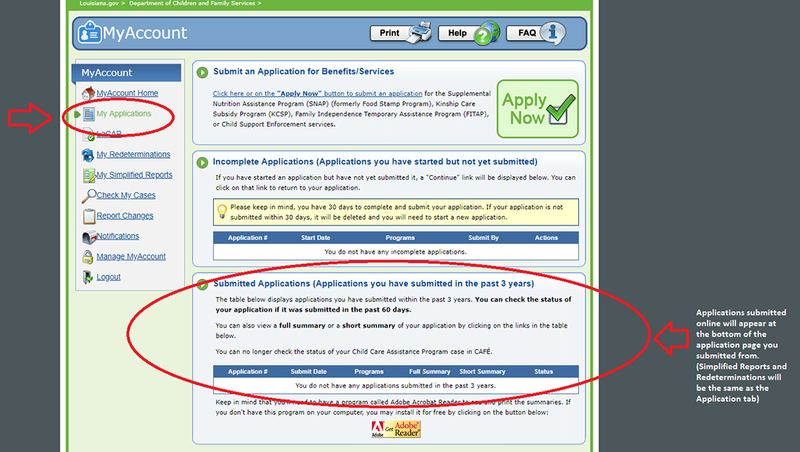 Visit a local DCFS office for in-person assistance with your online application. Some DCFS Community Partners also have someone on-site who can help you with your application. More information about services available through DCFS Community Partners can be found here. You can also contact DCFS at 888-524-3578 between the hours of 7:30 am and 6:00 pm Monday through Friday or by email at LAHelpU.DCFS@LA.GOV and request information about the DCFS office nearest to you.